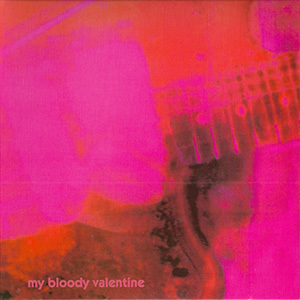 This past seven days, I’ve been listening to My Bloody Valentine’s album “Loveless” from 1991. I devote each week to a different album considered great in order to improve my own craft as a songwriting musician. It also introduces me to a lot of great music. This week was an unusual challenge. At first, I thought the album was awful. By the end of the week, I thought it was mostly awful. The blame does not fall on the songwriting. In fact, I find it difficult to speak about the songwriting at all. The recording and production choices stand as a major hurdle for me. The way they play their instruments did not help either. This album drowns the listener in a lush warm fuzzy wall of sound. The use of reverb, including the weird reverse-reverb, gives instruments like the guitar an expansive atmosphere of depth. Or at least they would, except the sound is often flattened by emphasizing the production layer. This album often reminded me of an old cassette tape deck I had. The worn out belt would cause the playback speed to rise and fall. Parts also reminded me of another tape recorder on which the head wasn’t aligned quite right. When used to record music on a tape that already had something on it, you would get a mix of the new audio, the previous audio, as well as a little bit of the opposite side in reverse. All of these oddities brought focus to the medium of tape, which is flat. Much of “Loveless” sounds two dimensional to me in the same way. Guitarist and principal artist of My Bloody Valentine, Kevin Shields, has a fascination with the whammy bar. He strums the guitar while applying pressure to the bar. This creates an effect where the guitar frequently undulates in and out of tune. Pushing this through layers of reverb provides the listener with a feeling of seasickness. It sounds cool, except that he’s doing it too much. As a child, I dug the syncopated way my Speak-N-Spell said “apostrophe.” I pushed the apostrophe button over and over again; It brought me joy while annoying everyone around me. The guitar, the effects on the guitar, dominate the album. For most songs, the guitars shove the other instruments to the back. Drum loops rotate behind the wash of fuzzy reverb. Hints of bass guitar come and go. Sometimes something that sounds like keyboard overloading a toy speaker pushes between the blanket of guitar. The songs also have vocals. I’ve heard them washed out by reverb and pushed well-beneath everything else. This is not true with all songs, but it seems to be the preference. The vocals sing in a quietly disinterested way, as if they are provided more out of obligation than desire. This expresses a cautious layer of self-conscious cool. It almost works, but I would push the vocals more forward, give them some presence. They do have melodies and probably even lyrics, if you can manage to hear them. The start of Only Shallow misleadingly implies a guitar-driven alt-rock album. As mentioned earlier, the focus on the album is more production and creating atmospheres of noise. While it can be argued that these are integral to the songs, I feel that the songs became reasons to create noise. This leads to soundscapes enjoyable in small doses. They wear tiresome long as whole songs. Frequently, I would get whiffs of Stereolab, one of my favorite bands. The second track Loomer reminded me of Stereolab’s album Transient Random-Noise Bursts with Announcements like the song “Jenny Ondioline” which I love. My Bloody Valentine released “Loveless” two years before that Stereolab album. I may’ve liked My Bloody Valentine more if I’d heard them when I was in high school, instead of 25 years later. “Here Knows When” provides a strong example of the elements I don’t like about this album. I suspect fans of the band love this song for the same reasons. Imagine alternately recording Cocteau Twins, Jesus and Mary Chain, Stereolab on a worn out cassette tape with a cheap recorded and then recorded the sound of a motorcycle race over it. I really feel like this started as a good song. For me, When You Sleep stands out as the best track. the song brought “Degrassi High into my mind for reasons I can’t understand. The use of a melodic instrument between verses and choruses helps tremendously. Vocal samples of ‘ooo’ played like a warped mellotron interact musically with the apparent synth. They’ve layered male and female vocals in a way that successfully brings the vocals forward, almost. I still don’t know what most of the lyrics, but I like what I’ve caught. I suspect an expression of awkward teen crush and bubblegum. Then it goes on too long, over-compressed and lacking variation.